At Powell Dental, PC, we understand that straighter teeth are not only more aesthetically pleasing but are generally healthier than those that are crowded or misaligned. Gaps in the smile can attract leftover food particles that generate decay and issues with your bite can lead to grinding, discomfort, and even painful TMJ symptoms. An aligned bite provides proper function and comfort, while a uniform smile exposes more surface area for your toothbrush to reach, leading to cleaner teeth. Our Portland Orthodontist, Dr. Ryan Blair, is committed to providing top-quality orthodontic care for children and adults who can benefit from a straighter smile. Powell Dental offers a range of orthodontic treatments, from traditional metal braces for children and young teens to cosmetic and clear braces for adults. Traditional Metal Braces – for children, patients with complex malocclusion, and in other cases where removable aligners trays or expedited treatment are not appropriate. Dr. Blair frequently recommends traditional braces for teenage patients because they are bonded to the surface of teeth. There’s no risk of your teen forgetting to re-insert their orthodontic appliance after meals or brushing their teeth. Braces are the most reliable way for young patients to achieve the smiles they want. We customize braces with multi-colored bands to help make treatment more suited to your child’s tastes. At Powell Dental, PC we embrace the effectiveness and dependability of full orthodontics as the most straight-forward way to help you or your child achieve a smile that is healthy and beautiful. Clear Braces – for adults who wish to gain a straighter smile in a discreet manner, we offer both Clear Correct® and Invisalign® in Portland. Powell Dental, PC provides clear braces, an effective and virtually invisible method of teeth-straightening. Our patients are given transparent trays that are custom-molded, removable, and comfortable. Trays are worn for an average of two weeks and then replaced with a new aligner, each moving you closer to your ideal smile. 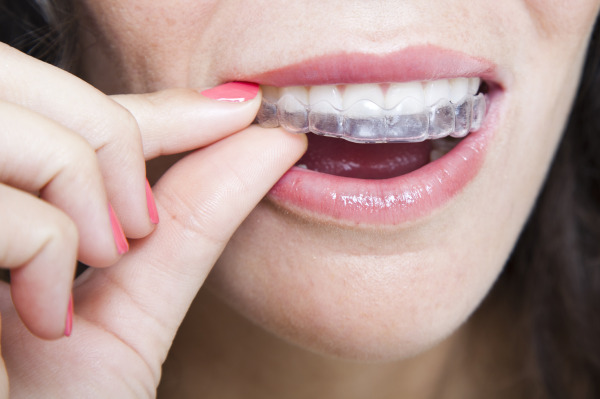 Clear braces can treat mild to moderately complex alignment and bite issues. Six Month Smiles – for our patients with mild to moderate issues like gaps and crowding. These tooth-colored braces straighten teeth more discreetly an in less time than other methods by focusing on aesthetic issues instead of functional problems. Call Powell Dental to learn more about getting straighter teeth with braces from our Portland Orthodontist today!